In his new book, Jeff Nesbit unpacks the rising political tensions between India and Pakistan as a critical water source begins to shrivel up. Will it trigger a nuclear war? The following is an excerpt of This Is The Way The World Ends by Jeff Nesbit. Pakistan is one of the fastest-growing nations in the world. It had a population of 170 million in 2011. Five years later, that population crossed the 200 million mark. The country is grappling with the same sorts of growing pains that its neighbor, India, is experiencing. But Pakistan has an extraordinary problem looming on the horizon: water scarcity, which has devastated other countries in the sub-tropics in the past decade, is now quite real. And a solution to the crisis is not entirely within the country’s control. The Indus River is the primary source of freshwater for most of Pakistan. It’s responsible for much of the water that’s used in both Pakistani households and industries. Water from the Indus also supports 90 percent of the agricultural sector in Pakistan—a particular problem for a country that, like others in the sub-tropical regions of the world, is arid and dry to begin with. The Indus, like the Nile in Egypt, is one of the great rivers of the world. But the river has been so exploited in the past two decades—even as dry conditions grow worse in sub-tropical regions—that it no longer even flows into the ocean at the Port of Karachi. The Indus is “dribbling to a meager end. Its once-fertile delta of rice paddies and fisheries has shriveled up,” water expert and author Steven Solomon has written in The New York Times. Once a lush ecosystem, the lower Indus and the varied habitat it supports is now threatened in myriad ways. “Choked off from its water supply, Karachi is plagued by increasingly brazen water thieves and riots over scarcity. Many in the water-stressed delta blame wealthy landowners upstream for taking water out of the river,” National Geographic reported in a special series on global water issues. Will World War Three Be Fought Over Water? But here’s where it gets especially treacherous for Pakistan. Compounding the over-use and changes inflicted on the arid region from the Earth’s climate system, actions by India to cut off some of the flow of water feeding the Indus has created the potential for serious conflict between the two nations. The glaciers that feed the Indus originate in India, which has implemented large-scale diversions of the freshwater as it cascades down from those glaciers. India has even bigger plans for diversions. This, not surprisingly, has created considerable tension with Pakistan. “One of the potentially catastrophic consequences of the region’s fragile water balance is the effect on political tensions,” National Geographic reported. “In India, competition for water has a history of provoking conflict between communities. In Pakistan, water shortages have triggered food and energy crises that ignited riots and protests in some cities. Most troubling, Islamabad’s diversions of water to upstream communities with ties to the government are inflaming sectarian loyalties and stoking unrest in the lower downstream region of Sindh. A bit of context is necessary here to understand how severe a problem this is right now for Pakistan—and how it can become catastrophic in the near future. The Intergovernmental Panel on Climate Change—a definitive report on the causes and impacts of climate change globally compiled by thousands of scientists every four years—has signaled for nearly a decade now that dry regions of the world in the sub-tropics will continue to see less and less rainfall. Some of this is already occurring. The Horn of Africa (which includes Somalia, Yemen, and Kenya) falls squarely in the sub-tropics where decreased rainfall has a severe impact on already dry regions. India and Pakistan do as well. The overall effect of climate change is an intensification of the water cycle that causes more extreme floods and droughts globally. The sub-tropical regions of the world are ground zero for these impacts. An IPCC special report on climate change adaptation says that at least a billion people in sub-tropical regions of the world like Pakistan, India, Yemen, Saudi Arabia and Somalia will face increasing water scarcity. These sub-tropical regions will suffer badly from reduced rainfall and increased evaporation, the IPCC concluded. As we’ve seen in Somalia, these impacts on top of shortsighted industrial agricultural practices and deforestation are even now creating horrific humanitarian challenges. That’s the backdrop for the growing conflict between Pakistan and India over freshwater and the Indus River. Nearly all of agriculture in Pakistan relies on the Indus. So do Pakistani households and industries. If India continues to create large-scale diversions of water that flow into the Indus, the potential for conflict between India and Pakistan will become very real. Verbal jousting will turn into water riots or even armed conflict. Glacier melting is responsible for roughly half of the water flowing in the Indus, making the situation worse. The health of the Himalayas in the face of the Earth’s changing climate is a real, and growing, concern. “Given the rapid melting of the Himalayan glaciers that feed the Indus River… and growing tensions with upriver archenemy India about use of the river’s tributaries, it’s unlikely that Pakistani food production will long keep pace with the growing population,” Steven Solomon wrote in The New York Times. The potential for conflict—including military conflict—between India and Pakistan over the Indus River is one of the reasons that former President Barack Obama and his then-Secretary of State Hillary Clinton added “water” as a diplomatic priority early in the previous administration. In her briefing, Otero also stressed the growing challenge from global warming on countries like Pakistan and India in sub-tropical regions. Changes in weather patterns will cause some regions to see intensified drought while leaving others drenched in rain. In the summer of 2010, in fact, Clinton announced a massive foreign aid package built around water security that was primarily designed to benefit Pakistan. The $7.5 billion aid package was built to bolster national storage capacity, irrigation, and safe drinking water in Pakistan. Beyond the conflict with India, Pakistan has an enormous infrastructure problem on its hands. The country has the world’s largest continuous irrigation system, and it is littered with all kinds of problems along its route that have been left unattended for far too long. Just as we’ve seen in Yemen—where water riots ripped the country apart and led to a civil war that has destabilized the country in the midst of political chaos—wealthy, politically connected landowners in Pakistan have also been accused of siphoning off far more than their fair share of freshwater in upriver Punjab. There have been water riots over lack of water and electricity in Karachi. Moves by India have aggravated an already tense situation. The Indus Waters Treaty between India and Pakistan was hammered out in 1960 to share the Indus River. The treaty is designed to make sure that volumes of freshwater downstream aren’t diminished by industrial uses or dams upstream. When India built a series of hydropower dams where the tributaries feeding the Indus emerge from the Himalayas, it didn’t technically violate the treaty. But experts believe that India’s efforts to dam up the Indus could ultimately destroy Pakistan’s ability to feed its population. If both countries collaborated on a series of giant, large-scale dams that were built to rotate water use to different regions, tensions could be reduced. But that level of cooperation between nations over water use has never truly succeeded on the scale needed to deal with the looming threat. The potential repercussions aren’t contained to this region. What happens in the region affects the global economy as well. As one example, a third of the world’s cotton supply comes from India and Pakistan. More than 700 billion gallons of water are pulled from the Indus River every year to grow this cotton. The public anxiety and tensions about the potential conflict over water between Pakistan and India, however, are even more direct when Western diplomatic analysts talk behind closed doors. In a series of secret State Department cables released by WikiLeaks, the analysts don’t pull any punches. Pakistan claimed that India was causing rolling blackouts in India by diverting water from the Indus. “The water shortage will likely lower winter crop yields as irrigation levels are lower and has already resulted in increased blackouts due to reduced hydroelectric power generation,” said a second cable. At one point during an especially tense set of negotiations between the two countries, the U.S. ambassador to India during the Bush administration (David Mulford) wrote that Indian dams being planned along the Indus could lead to war. A decade ago, India and Pakistan seemed content to wage their “water wars” behind closed doors, in confidential diplomatic cables or in the halls of third-party arbiters like the World Bank, the United Nations, or the International Monetary Fund. No more. In the fall of 2016, things took an ominous turn. India and Pakistan have fought three wars over Kashmir. Both lay claim to it and also administer portions of it. At the end of September in 2016, India’s military staged a surgical strike inside the parts of Kashmir administered by Pakistan in an effort to target seven terrorist camps. Excerpted from This The Way The World Ends by Jeff Nesbit. Copyright © 2018 by Jeff Nesbit. Reprinted with permission of the publisher, St. Martin’s Press. All rights reserved. 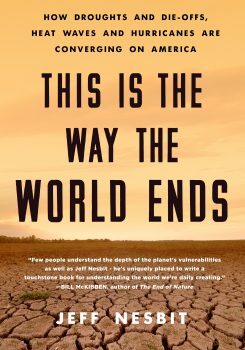 Jeff Nesbit is author of This is the Way the World Ends: How Droughts and Die-Offs, Heat Waves and Hurricanes are Converging on America (Thomas Dunne Books, 2018). He’s also executive director of Climate Nexus, and former director of public affairs for the National Science Foundation. He’s based in New York, New York. How making simulated asteroid dirt paves the way for a future of space mining. The waters of the Rio Grande are closely regulated. But what about the water hidden in aquifers deep below the Mexico-Texas border?